If you’ve ever wanted to be a writer, perhaps this upcoming Wii U eShop release will let you start to make those dreams a reality (on a very basic level). uWordSmith is a new puzzle game for Wii U by Temple of Yog developer CHUDCHUD Industries. The creator, Cody Diefenthaler, has been promoting the project with Vine clips and screenshots via his Twitter account. So far, Diefenthaler has revealed that uWordSmith will include arcade and challenge modes, and also feature a mosaic mode and multiplayer option. In addition to this, players will be able to post & share their records on Miiverse, and have the ability to unlock even more content within the game by earning stars. 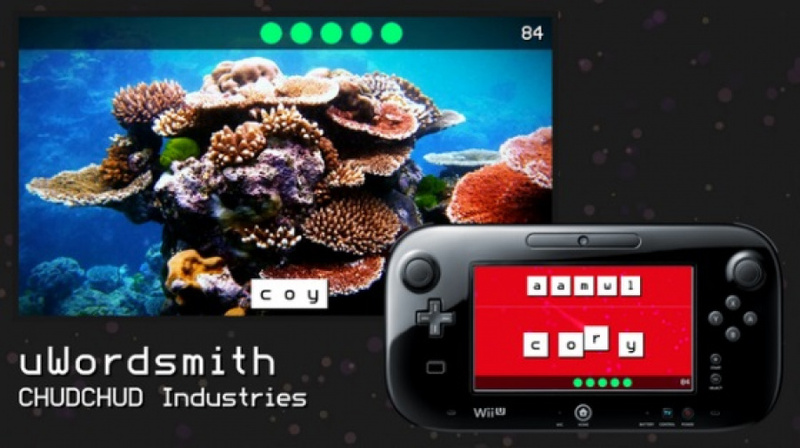 uWordsmith is the ultimate two-screen word puzzle game for the Wii U™ console! Unique gameplay features photos on the TV you must spell by dragging and arranging letter blocks on the Wii U™ GamePad. Hundreds of items, a variety of modes, and bragging rights on the Miiverse™ will keep you and your friends hooked on this exclusive title available on the Nintendo eShop! The title is due out in North America this December for US$1.99, with a release outside of this region yet to be announced. Take a look at short clips and trailer below and let us know in the comments if uWordSmith is the type of game you would be interested in purchasing from Nintendo's digital storefront. This is a game my wife could play for hours. Heh, looks clean and polished from the other games you see like this for the WiiU. I welcome this. I don't mind games like this every now and then. I may look into it if the price is right. Lol, that top picture reminded me of Endless Ocean, and how much I'd love the U to get one. @andrea987 It would be great to see the return of Endless Ocean.